You can set up a connection between Klipfolio and Salesforce to display your Sales metrics on a dashboard, and share data on sales, customers, events, and leads with anyone in your organization. What options do I have for visualizing my Salesforce data? To get started right away with some pre-built content, check out the Klip Gallery for individual Klips. How do I connect to Salesforce data in Klipfolio? When you connect your Salesforce data to Klipfolio, you will be prompted to connect your Salesforce account by entering your username and password. Doing so will create your authentication token that enables Klipfolio to securely access your specified Salesforce data. It looks like George @ Salesforce. You can use and reuse the same authentication token every time you connect to Salesforce. Note: Manage your authentication tokens in Klipfolio under Connected Accounts in the Account section. How do I connect to Salesforce Sandbox data in Klipfolio? If you have access to a Salesforce Sandbox account, you can use the Salesforce Sandbox connector from the Connector Gallery in Klipfolio. The process of connecting to Salesforce Sandbox is exactly the same as connecting to a Salesforce account, so be sure to follow the steps in this article. The only difference is that you are authenticating with your Salesforce Sandbox account credentials and retrieving Sandbox data, rather than connecting to your regular Salesforce account. After selecting Salesforce Sandbox from the list, you will be prompted to connect your account by entering your Salesforce Sandbox username and password (it is typically a different username and password from a regular Salesforce account). The Salesforce Report option enables you to access all your Summary and Detailed Salesforce Reports and base your data visualization on information contained in those reports. When running data through the Salesforce API, reports can return up to 2000 rows of data. Summary reports show “aggregate-level” information that could be based on >2000 rows of data, for example, the number of opportunities for a specific region or total revenue for this month. Detailed reports display detailed “record-level” information, for example, every new sale today with all details. The data you are accessing exists in the same Salesforce Object or in a Custom Report Type. You have a limited number of API calls within your Salesforce organization and want to preserve them for other integrations or uses. Use the Build a SOQL Query option to return the full set of data. In Klipfolio, on the New Data Source page for Salesforce, at Retrieval Method, select Salesforce Report. At Retrieval Format, select how you want your data formatted: Summary data (CSV) for tabular Summary reports, Detailed data (CSV) for tabular Detailed reports, or Raw Data (JSON) for Detailed reports in JSON format. Choose a report from the list and click Submit. Verify that the data returned is what you want and click Continue. Enter the name and description, set the refresh rate and click Save. 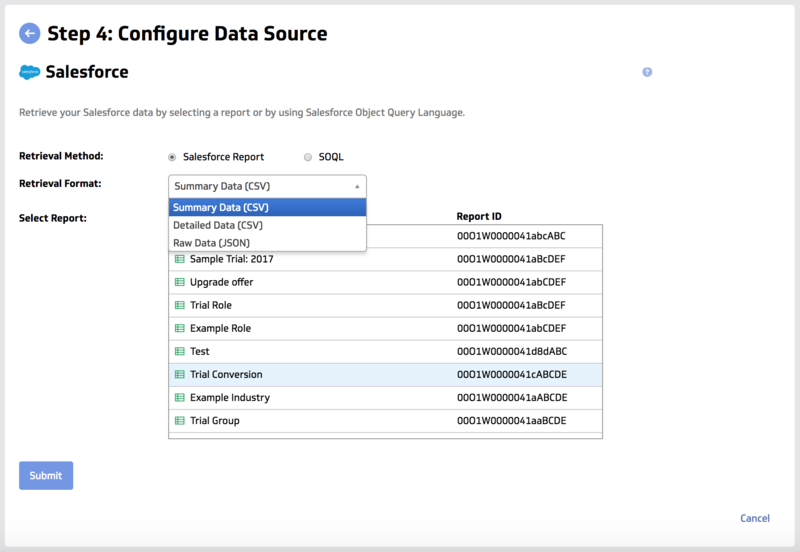 Note: By default, the original report name in Salesforce is set as the name of the data source in Klipfolio, and the Report ID is set as the description. Tip: For reports to display in the list of reports within Klipfolio, you must view and Run Report in Salesforce. This will mark it as a recently viewed report. Change the Retrieval Format drop-down list item to Raw Data (JSON). If allData is true, the query has returned the full set of data. If allData is false, the query exceeded the Salesforce API's 2000 row maximum. 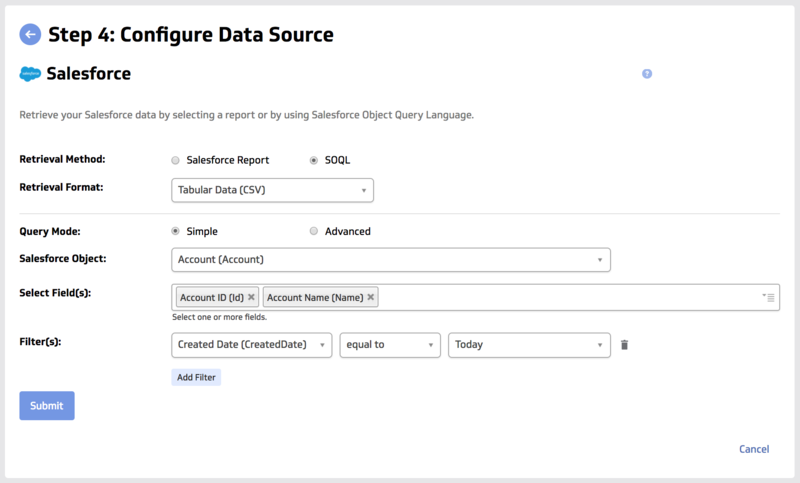 The data you are accessing exists across different Salesforce Objects and you don’t have custom reports that enable you to relate multiple objects. SOQL enables you to query related objects. You want to pull more detailed information from the History Objects, for example, AccountHistory, LeadHistory, and OpportunityHistory. This is especially useful when you only have access to standard, out-of-the-box Salesforce reports. Write your own SOQL query using either Query Mode: Simple or Advanced. Choose Simple to build your query using drop-down menus and filters. This method enables you to specify the data you want to access from Salesforce by choosing the Salesforce Object and the data fields you want returned per object. You can also filter the data by choosing Add Filter. In Klipfolio, on the Configure Data Source page for Salesforce, at Retrieval Method, select SOQL. At Retrieval Format, select Tabular data (CSV) or Raw data (JSON). At Query Mode, select Simple. At Salesforce Object, use the drop-down list to choose an object or use the search bar to find a specific object, for example an Account, Opportunity, or Lead. At Select Field(s), use the drop-down list or start typing a field name to find and select one or more fields of data. You can optionally click Add Filter to create one or more filters to further specify the returned data. Select a field from the first drop-down list. Note: Filtering on compounded fields, for example, BillingAddress, is not supported. You can filter on each field separately. Select a condition from the second drop-down list. Enter a value in the third textbox. Note: If you choose a field that contains dates, you can select a time period for the third part of the filter. At Query Mode, select Advanced. Note: Nested SOQL queries are not currently supported in Tabular data (CSV) Retrieval Format. For nested queries, select Raw data (JSON) format. How do I access pre-built Klips? In the Klip Gallery you can browse individual Salesforce pre-built Klips and add them to your dashboard. You replace the sample data that is included in pre-built Klips with your own Salesforce data by clicking the menu in the Klip and selecting Connect your data. If needed, refer to this article for some troubleshooting tips.